To set up direct deposit, you will need to know the branch, institution, and account number for your bank account. 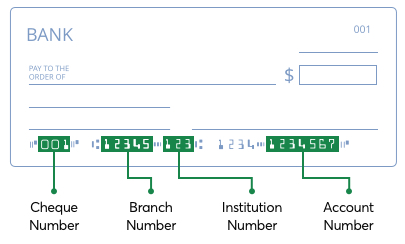 Your branch (transit), institution, and account number are located on the bottom of a cheque for the relevant account, as shown below. If you do not have cheques or cannot find the numbers shown, you will need to contact your bank.